Home » General » Pleased to Meet You » Hi from Sweden! If you have any images that you think would be good examples for our gallery, please feel free to let us know. We are always looking to add to the galleries. Colorize - I recognize your name from your amazing stock on Deviant art. Used it a few times for reference. Welcome! Oh, I have a heap that I could upload. But what kind of horses would you like to have featured in the gallery? Only those with interesting or in some way a bit special colours/patterns, or pretty much anything – including plain chestnuts and other “simple” colours? Welcome ltz :newbie I so enjoy talking to those from other countries and cultures to get their theories, perspectives and ideas. I am Critterkeeper and I live along the Blue Ridge Parkway area of northern North Carolina. My husband is an over-the-road truck driver so he is gone most of the time (11 days out of 14), but I have help here (son and daughter-in-law keep up the lawns and help feed daily, close friend Matt and farmer neighbor Paul help hay and with mare watching ). We have Quarter Horses...a cremello stallion; mares: a dark chestnut (often mistaken for bay, due late June) and 2 sorrel QH, a bay w/sabino retired rodeo bucking horse, a bay Paint (50/50 white - all QH lines; and the palomino offspring: 2 yr old dark golden, yearling Isabella, and a 1 month old - all fillies. We also have a newborn (a week tomorrow) colt (our first colt out of this stud - he has produced 11 fillies in 3 seasons). No buckskins yet but the Paint and other bay are expecting May/June. 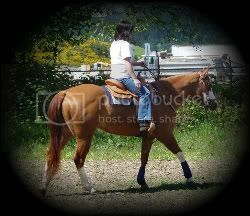 Oh, and I almost forgot our 20 yr old sorrel gelding. Hey! I've used a bunch of your stock before! Great to get to know the photographer a bit! Welcome to the forums!! !